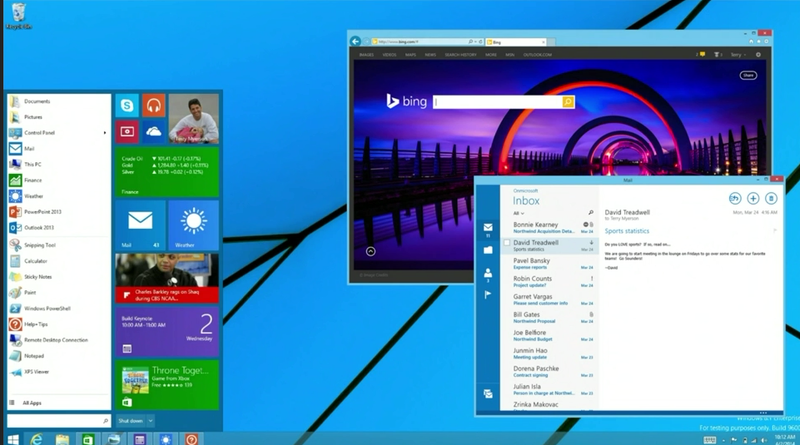 Windows 9: Goodbye, Charms bar, hello virtual desktops? Our first glimpse of Windows 9 may be right around the corner, as the new rapid-fire Microsoft scrambles to put the stigma of Windows 8's disastrous launch in the rear view mirror. Microsoft is set to officially unveil Windows "Threshold"—as it's currently code-named—at a press event on September 30 or soon thereafter, according to the Verge's Tom Warren. A week ago, ZDNet's Mary Jo Foley reported that Microsoft was targeting a "technology preview" for Windows Threshold in late September or early October. Both Warren and Foley are well-connected Windows watchers with a firm track record; the duo was the first to report on the Windows Blue update that eventually evolved into Windows 8.1, for instance. The Start menu and the ability to run Metro apps on the desktop are definitely coming to Windows 9. Rather than being a sweeping overhaul in the vein of Windows 8, Windows Threshold actually appears poised to dial back the gargantuan changes found in that operating system. Microsoft has already announced that the Start menu is coming back to the OS, joined by the ability to run Metro apps in discrete desktop windows. Recent leaks (including Foley and Warren's own reports) suggest other, mostly pro-desktop tweaks are inbound, including virtual desktop support, the removal of the Charms bar, and—possibly—the introduction of Windows Phone 8.1's sassy virtual assistant, Cortana, to Windows proper. Hopefully there's more to Threshold than simple UI changes. We can think of other features we'd like to see in Windows 9—15 of them, in fact. We'll know for sure what's making the cut before long, if the two reports prove true. And if they do, Microsoft will reportedly make the technical preview public, so that developers and enthusiasts alike will be able to take Windows 9 for a whirl. Fingers crossed.